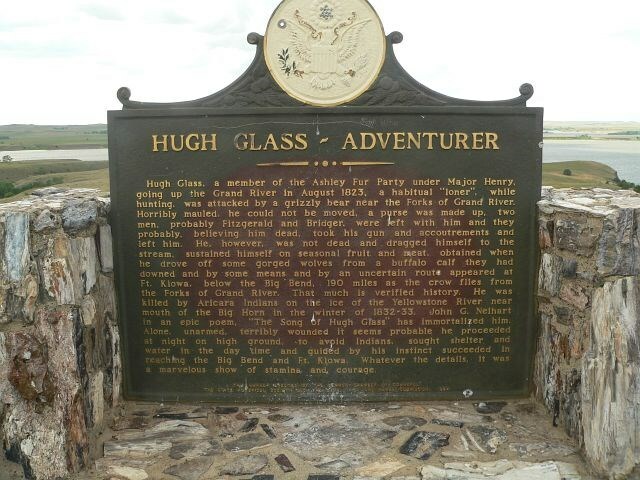 In 1823, Hugh Glass, in his forties, left with a nine person trapper expedition party, up the Missouri River to South Dakota. In August, while scouting, he surprised a grizzly with her two cubs. 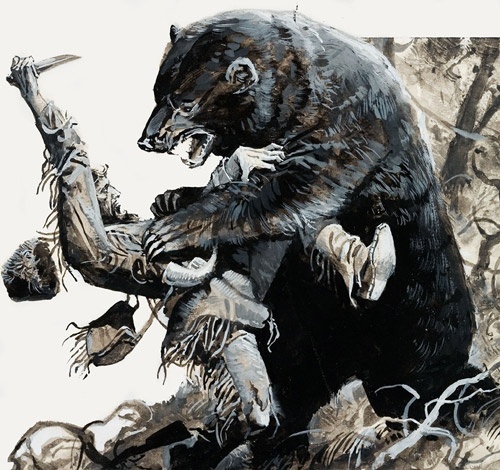 The bear attacked, picking Glass up and slamming him to the ground. He had been unable to get a shot off but he did have his knife and fought for his life. The other men, hearing his screams, ran to his aid. He was severely mauled and unconscious. The bear was dead. Major Andrew Henry was sure Glass was going to die and asked for volunteers to sit with him till the end came. Nineteen year old, Jim Bridger, (yes, the famous one) and twenty-three year old, John Fitzgerald agreed to stay. They dug a grave and sat to wait. They waited three days with Glass in and out of consciousness. 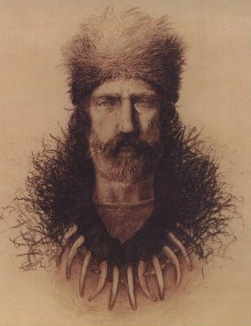 After three days, Indians came into the area and Fitzgerald convinced Bridger they had to make a run for it. They moved Glass near water, took his equipment and gun and took off. They figured he was dead anyway and reported him dead when they caught up to the rest of the party. Glass regained consciousness enough to realize he was alone and unarmed. Rage filled him at the men who would leave him in this state. His wounds were now severely infected. He had a broken leg and exposed ribs on his back. He set his leg and with one good leg and one good arm began crawling. He headed south toward the Cheyenne River about a hundred miles away. Maggots ate at the infected flesh on his back. As he crawled he continued to pass out. When he was conscious he would eat berries and roots. At one point, he was able to gorge himself on the remains of a bison killed by wolves. As he grew stronger, he was able to stand and walk. Some Sioux, took pity on him, cleaned his back and gave him food. It took six weeks but he made it to the river. There he built a raft and traveled down to Fort Kiowa, approximately another hundred miles. When he was healthy enough, he set off after the expedition party. They had continued on to Yellowstone. He caught up to them in 1824 and confronted a very shamed Jim Bridger. Glass let Bridger live, cause he was so young, and set out after Fitzgerald. He eventually caught up with Fitzgerald but couldn’t kill him as planned. Fitzgerald had joined the Army and they wouldn’t let a civilian kill a soldier. He got his rifle back and a collection of money from the troops. He left knowing he had at least shamed Fitzgerald in the face of his other soldiers.